The big news in energy last week was that the International Energy Agency projected the United States will overtake Saudi Arabia as the world's leading oil producer by 2020. If accurate, the significance of this information is hard to overstate, and its ramifications for the economic, military, and political future of the world are myriad and complex. In theory, at its most basic, this means cheap oil and an end to foreign energy dependence, but, as you'd expect from so multiplex a commodity, it's not that straightforward; indeed, the forthcoming US oil production boom is nothing short of a geo-eco-political imbroglio. From a market point of view, the first consequence one would expect would be for crude to become a demand-driven market; if we have all the oil we need from sea to shining sea, supply would play less of a factor on the price of a barrel then would the demand to burn it up. Unfortunately, it's not that easy. For the price of a good to accurately reflect the pressures of supply and demand, the market has to be open to all participants - a market can't operate (or at least maintain liquidity) without scores of individuals buying and selling. However, it turns out the oil market is much more constraint-laden than other global commodity markets (rice, lumber, coffee, etc). There are a few reasons for this. The first, which I didn't know until after this story broke (and which became the impetus for my writing this piece), is that the United States generally prohibits exports of crude oil. That's right, America, bastion of free markets and free men, generally disallows the exportation of one of the planet's most basic economic inputs. (This, I have to assume, is one of the many reasons why Brent Crude, a somewhat inferior British grade of oil has for the last couple years been trading at a price significantly higher than its American counterpart, but that's a topic for another day.) While it isn't technically illegal to ship crude offshore, regulators certainly don't make it easy; as far as I understand (and someone please correct me if I'm wrong), any exporter of American crude is required to get dispensation from the Department of Commerce, and even then the exporter is highly restricted in his or her trade. Okay, you might think, so the Middle East would become more unstable (if that's possible) without a permanent US military presence, what has that got to do with the price of oil if we're extracting all we need domestically? Consider a world in 2025 where US oil exports remain strictly regulated, nations in the Persian Gulf must allocate tremendous expense to secure shipping lanes, and the Peoples' Republic of China has a fully modern economy with a healthy appetite for petroleum products. You've now created two entirely distinct international markets for oil, nurtured a hidden economy built on piracy and black markets, and functionally turned the United States into a global oil cartel. In this fertile breeding ground for militarism, the newly modern navies of the world would swell to protect oil access, conflicts in crude producing nations would flare up like oil fires, and all the while the US (whose oil consumption has incidentally been falling and will likely continue to fall) sits on an ocean of oil, unwilling to share and unable to profit from its export. On the other hand, the US could lift entirely its restrictions on crude exports (treating crude the same way we treat almost every other commodity on the planet). 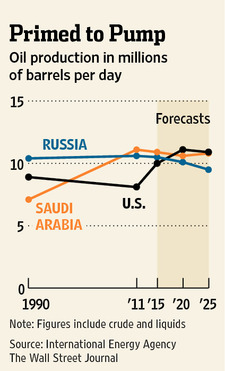 In so doing, American crude would compete with Middle Eastern and other geographic varieties of oil; nations would have less incentive toward militarization as crude is more readily available; the global economy would grow as more countries are able to modernize on the back of readily accessible, transparently priced energy; and, most important to any commodities investor, the price of oil would reflect, simply, the price of oil. I realize that in the course of this piece I have not addressed the very real need to switch to renewables. This is obviously tremendously important for the future of our planet, our environment, and our continued existence as a species, but the US won't hasten a fully green economy by extorting other countries and forcing them into war-mongering. As America moves forward, she should not cling to cold-war ideas about resource protection and paranoia; this is the land of the free, after all. Our markets should be likewise. Today the Wall Street Journal ran an article describing why commodities ETFs are terrible instruments with which to make long-term commodities plays. The crux is that, largely because of the roll yield, ETFs do not actually track the prices of the commodities they purport. Readers of this blog may remember that I wrote a functionally identical article nearly three years ago, first at HardAssetsInvestor, and a bit later right here on AssetPrime. Briefly, the vast majority of commodities markets follow a normal futures curve, wherein the prices for contracts of a commodity further out are more expensive than the contracts closer to expiration. That is, in February of a given year, the price for March widgets would be cheaper than the price for July widgets. 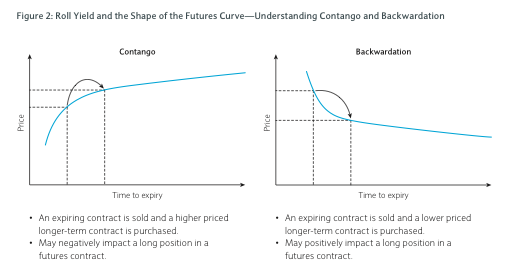 (People usually call this situation "contango"; and while that's not technically correct, it's not worth getting into the semantic distinction in this article, other than to acknowledge that people are going to be using that word to describe a normal futures curve.) Most commodities ETFs work by holding the front month contract of a given commodity, then selling that contract shortly before expiration and replacing it with the next month in the futures chain. If, indeed, the market is in a normal futures curve, the next month contract in the chain will be more expensive than the contract approaching expiration. Selling low and buying high does not typically a profit make. Hence, even when the price of a commodity is increasing over time, much of that value may be lost to the monthly roll-yield penalty. This is important, because the entire purpose of a commodities ETF is to track the price of a commodity, thereby providing investors exposure to those markets. Significantly, most commodities ETFs do not do this. At all. Commodities ETFs do not do the one thing they were created to do. 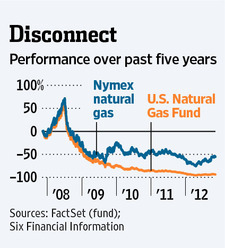 Commodities ETFs are terrible. Interestingly, many of the banks that issue these ETFs (or ETNs, as the case may be) have gotten more upfront about the issue. The iPath commodities ETN page, for instance, discusses the roll yield before even listing the funds one can invest in, and their "iPath Commodity ETNs" pdf sheet includes a handy graphic (displayed at right) explaining the nature of the problem. 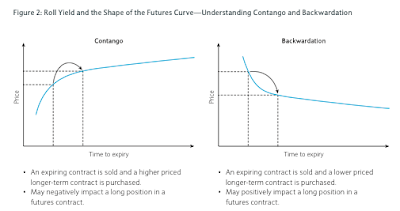 (Incorrectly, of course, calling a normal futures curve "contango" but again, that discussion belongs elsewhere.) I have to admit that I'm impressed at the level of disclosure by iPath here; I don't know the extent to which a bank is even required to do this. However, while the facts given are certainly correct, the prospectus fails to mention that the majority of the time, the market is in a normal futures curve ("contango") rather than an inverted curve when a fund would potentially make money ("backwardation") from the roll yield. That is, they fail to mention that most of the time, the roll yield is a bad thing. Some banks, of course, have gotten wise to this problem and have implemented funds that attempt to avoid the pitfalls of the standard roll yield. The United States 12 Month Oil Fund (USL), for instance, (cousin to the much more popular USO fund) holds all twelve futures contracts for the upcoming year (one for each month) rather than just the front month contract. iPath (mentioned above) offers a series of Commodities ETNs that use a proprietary algorithm to select which contract a fund should hold. The basics of the strategy are overviewed in their document "Basics of iPath Pure Beta Commodity ETNs" on the iPath website. I examined USL in the aforementioned HardAssetInvestor article and found a much better statistical correlation between that fund and the price of oil compared to similar funds. I haven't had a chance to dig into the iPath Pure Beta ETNs (having just learned about them), but I'm very curious to know how good they actually are at mitigating the roll yield. You can be sure I'll report back here with any and all findings. Even if it's coming three years too late, I'm glad to see folks are finally waking up to this. Most commodities ETFs that hold futures contracts simply don't do a good job tracking the prices of commodities. The most valuable commodity is information. I could hit the thesaurus and start coming up with different words for "information", but I won't do that - you get the point. Every investment one makes is, despite its underlying instruments, at its core, an investment in information. Whether you think a particular grain or metal will go up or down in value is the direct consequence of your information and the faith you have therein. In that way, buying a stock, or a gold contract, or a mutual fund, in essence, can be considered an investment in an information derivative. As a general rule, I'm not much of a fan of derivatives, whenever possible I prefer to invest in an instrument directly. Lucky for folks like me, there happens to exist a market that trades directly in information. The IEM is an online futures market where contract payoffs are based on real-world events such as political outcomes, companies' earnings per share (EPS), and stock price returns. I, of course, realize that this is very similar to Intrade and other information market sites that offer contracts based on real-world events. The IEM, however is different in two important ways. First, it is entirely not for profit; there is no "house", making money on the trading activity, nor any recurring custodial fees, nor any party interested in impeding your withdrawals - the market is run by the University of Iowa as an educational resource of the business school. And second, most importantly, the IEM is entirely legal in the United States. The same cannot be said of other online information markets. There are precisely the same number of contracts issued for each outcome, and the price for each contract trades between $.00 and $1.00, such that the total value of the two contracts combined is $1.00. The contracts trade on an open market with the familiar bid/ask market pricing structure. When the election is over, any contracts held for the winning candidate are redeemable for $1.00, regardless of what they cost, and any contracts held for the losing candidate are redeemable for $0.00000 (repeating, of course). As of writing, the Democratic contract (Obama victory) is trading at $0.750, and the Republican contract (Romney victory) is trading at $0.250. So, if you were to today purchase 100 Obama contracts for a total of $75.00, should the president win reelection, on Wednesday your contracts would be worth $1.00 each, or $100.00 total, good for a 33.3333 (repeating, of course) percent return on investment; alternately, if you were to buy 100 Romney contracts, your cost would be only $25, but should the governor win the election, you'd be looking at a 300% ROI. The market also allows participants to functionally short contracts by purchasing the same number of each contract (for $1.00 per bundle) and then selling any sub groups of contracts, in essence, betting that the price of the contracts held will go up in value compared to the price of the contracts sold. Since the two outcomes are mutually exclusive, they have a nearly one-to-one negative correlation. All that said, the IEM is actually most notable not just for facilitating bets seen to maturity (when investors take delivery of their info-commodity), but for providing a market throughout the election season, thereby becoming something of a barometer for overall sentiment around the race at any given moment. In fact, historically, the IEM has been shown to be a better predictor of the outcomes of elections than most major polling sources. The ridiculous graphic on the right (which came directly from the IEM's website) provides an illustration of this fact from the 2008 presidential election. The price of a specific contract, in essence, represents the market's belief as to the probability of the associated event occurring. The theory goes that these markets end up being more accurate than polls because when people are forced to vote with their wallets, as much as they may like one candidate or the other, they're still Americans after all, and Americans rarely pass on an opportunity to make some cash. So, back to the current year, when I say that the Obama contract is trading at $.75 to the Romney contract's $.25, this implies that, as of now, the market is giving Obama a 75% chance of winning the popular vote to Romney's 25%. Note how much more strongly the market is predicting an Obama victory than are most pollsters. However, this does not mean the market believes it's going to be a tremendously lopsided victory, in fact, just the opposite, as the IEM also offers a proportional vote contract that pays out based on the relative vote share for the major-party candidates (Republican or Democrat). That is, if you happen to be holding a Romney contract in this market, and Romney ends up winning, say, 48% of all votes cast either for Romney or Obama, that contract will be worth $.48, while an Obama contract would be worth $.52. As of writing, the Obama contract is currently sitting at $.505, while the Romney contract is trading at $.492 (an enterprising arbitrageur could take advantage of those totals not summing to $1.00). So, the IEM is giving Obama a 75% chance of winning the popular vote, but only edging Romney out by something in the neighborhood of 1% of all votes cast for the two major candidates. Agree with those sentiments? If not, I know a place you could potentially make a profit from your contrarian sensibilities. It's been said that knowledge is power, and for most investors power is money, but in the information markets, interestingly, money is also apparently knowledge. NB: Obviously I've chosen to focus on the presidential election in this post, but the IEM offers contracts for all kinds of other events, often around politics, but also concerning miscellaneous goings on in the popular zeitgeist. All of which are, naturally, very, very interesting. It's a great market to follow. Though not traded on a futures exchange, wine is still, literally anyway, a commodity. Further, it's a commodity that many people invest in, typically in the form of collectible rare/old wine. At a party when this ever comes up, usually someone says something like: "over time, rare wine is one of the safest investments when compared to blah blah blah". There's rarely any data to back this up, but that doesn't matter because it seems believable and it's kind of cool. Someone should look into that. Wine bars and boutiques are sprouting across Beijing, and trendy young consumers are flocking to wine-tastings at swish hotels. A dramatic 54 percent rise in wine consumption in China between 2011 and 2015 is predicted, a reflection of the increasing affluence of China’s middle classes, according to a new study by Vinexpo, Asia’s biggest wine exposition. Let's leave aside for the moment that this study was conducted by a "wine exposition" (whatever that is) and focus on the purported reasoning behind the growth. Specifically, that the increase in wine consumption is "a reflection of the increasing affluence of China's middle classes." 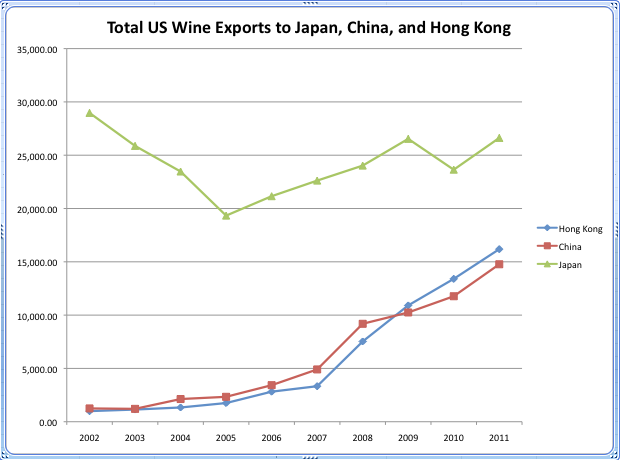 The article also goes on to say that 40% of Chinese wine imports are from France, specifically. Plenty of countries make wine; that the increase in imported varietals seems to be focused on French wine implies not just that an increasingly affluent middle class wants to buy wine, rather, that they want to buy good wine. Grape wine of an alcoholic strength not over 14% in containers holding 2L or less. Grape wine of an alcoholic strength not over 14% in containers holding more than 2L. Grape wine of an alcoholic strength of over 14% in containers holding 2L or less. Grape wine of an alcoholic strength of over 14% in containers holding more than 2L. I don't know, exactly, what the distinction between sparkling wine and effervescent wine is, but types 3 through 6 could generally be thought of as "standard bottled table wine", "standard boxed table wine", "fortified wine" and "holy hell I have a death wish", respectively. 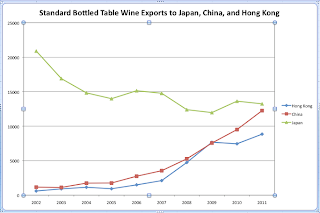 Interestingly, the China and Hong Kong trends for standard bottled table wine follow pretty closely the general trends for ALL wines exported to those countries, while the Japanese trend looks altogether different. A little stats shows that this is precisely the case. Who knew the Japanese had such a taste for Night Train? 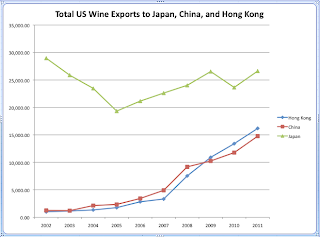 That means that ~97% of Hong Kong and China's change in wine importation from the US over the last ten years can be explained in terms of their importation of wine at 14% alcohol in containers smaller than 2L. That is, standard table wine. 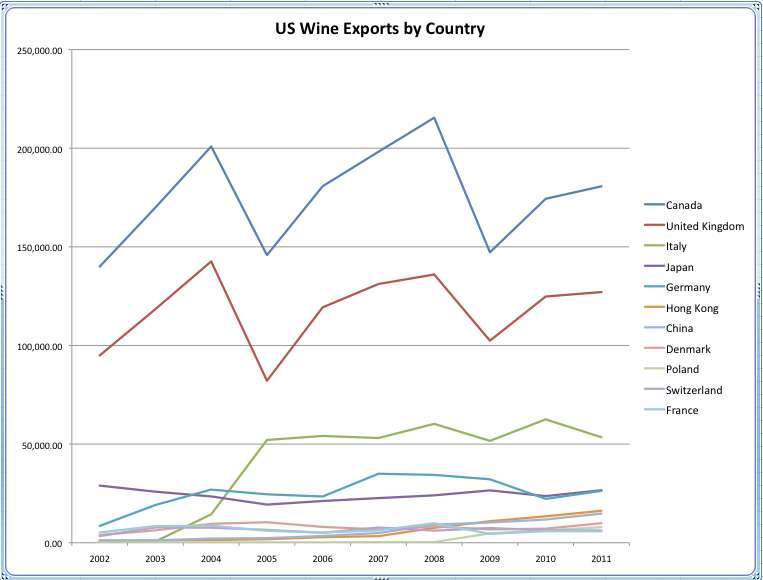 The article mentions that the majority of wine consumed in China is produced domestically. 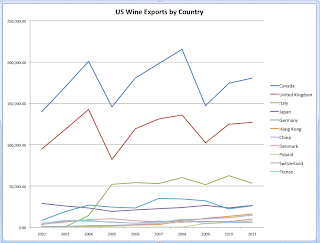 What the change in export number then means, really, is not that China is drinking more wine, per se, but that more people are drinking better wine. To that end, the article's thesis is entirely correct, but not just for French wine, for all high quality wine. Until Chinese vineyards begin rivaling the quality and consistency of the best vineyards in France, the United States, and elsewhere, as China's citizenry gains spending power in the global economy, look for this trend to continue. If you were hoping to come away with an investment idea here, you may be out of luck; there is no grape futures contract in existence, but even if there were, it's unlikely investing in such an instrument would be worthwhile. Grapes aren't the key here, it's craftsmanship, tradition, and quality. 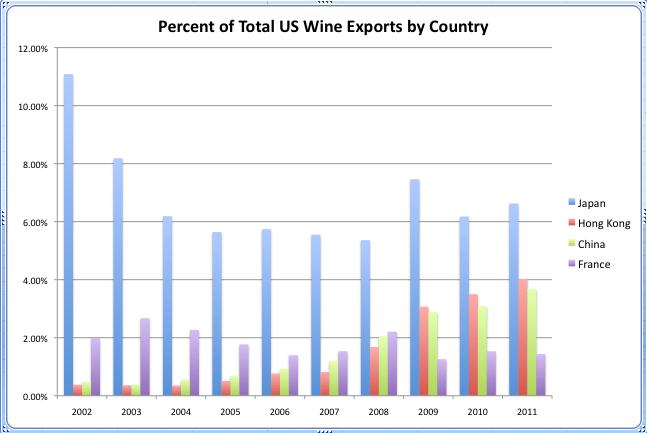 To that end, investors in rare wine may actually see a boon from the growth of wine exports to China. 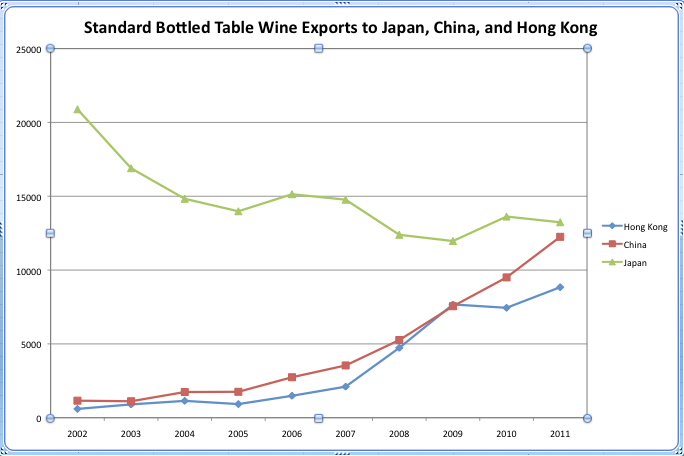 If demand for quality keeps up, that rising tide should, in theory anyway, boost the values of all high quality bottles. Normally I'd say something like "it's a good time to own a vineyard in Napa or Bordeaux", but really there's no need to state a priori truths. All material ©2010 - 2012 Twisted Pine Productions. Unless otherwise noted, historical market data obtained via Xignite.com. Unless otherwise noted, interactive stock charts via Wikinvest.com. Unless otherwise noted, all statistical analysis is done in R, a freely available statistical analysis package. Any information provided by this blog, including but not limited to commodity prices, statistical analysis, or price targets should not be construed as research, trading tips or recommendations, or investment advice and is provided with no warrants as to its accuracy. Market data, including US and International equity symbols, commodities prices, and other data is provided as is and this blog makes no claims as to its accuracy. Company names, products, services and branding cited herein may be trademarks or registered trademarks of their respective owners. The use of trademarks or service marks of another is not a representation that the other is affiliated with, sponsors, is sponsored by, endorses, or is endorsed by this blog.